Marilyn and I were talking about what we like to blacken on the grill. 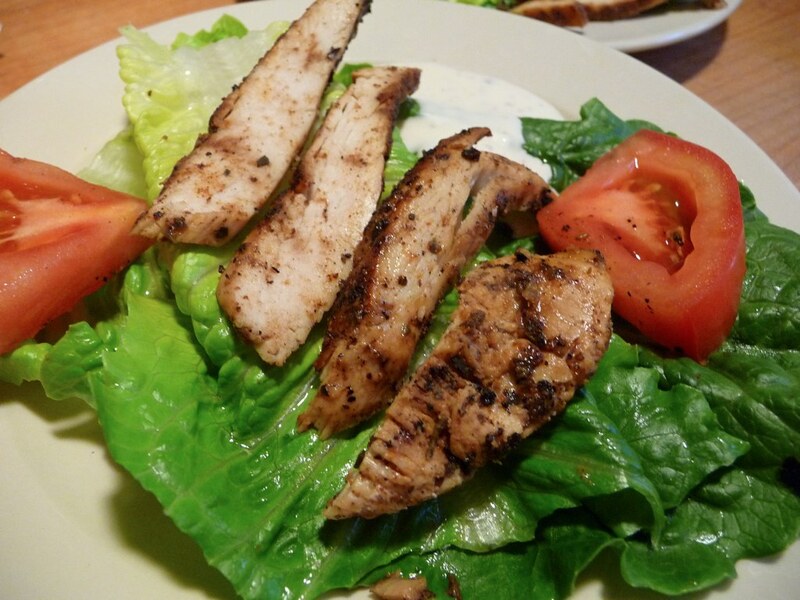 The usual shrimp, steaks and burgers came up… but she suggested Blackened Chicken. What? I admit I never heard of blackening chicken. So I quickly proclaimed “Let me check the Internets about that!”. Lo and behold, there are tons of blackened chicken recipes out there. 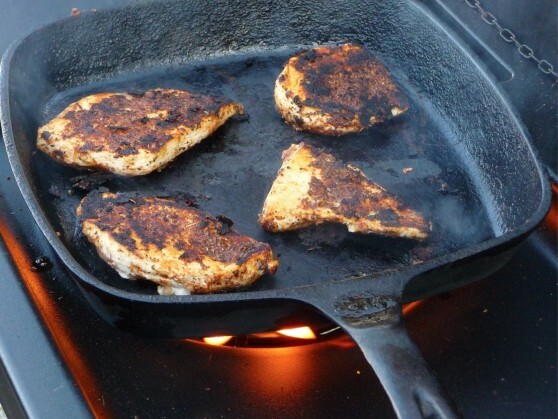 We went with a simple recipe idea that involved marinating the chicken breasts in Italian dressing (our go-to method), searing the chicken on the grill in a screaming hot cast iron skillet. 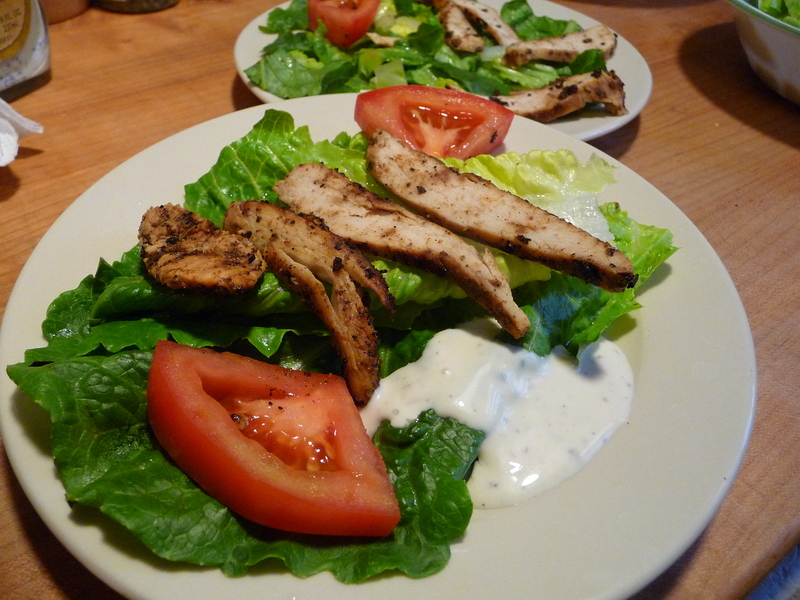 In the end, we sliced it for a Blackened Chicken Salad with Romaine, tomatoes and our current favorite dressing, Ken’s Creamy Caesar with Roasted Garlic. Spicy and delicious, this is a huge winner for me. Blackening is a cooking technique commonly used in the preparation of fish and other foods. Though often associated with traditional Cajun cuisine, it is in fact a modern invention of chef Paul Prudhomme. The food is dipped in melted butter and then dredged in a mixture of herbs and spices, usually some combination of thyme, oregano, chili pepper, peppercorns and salt. 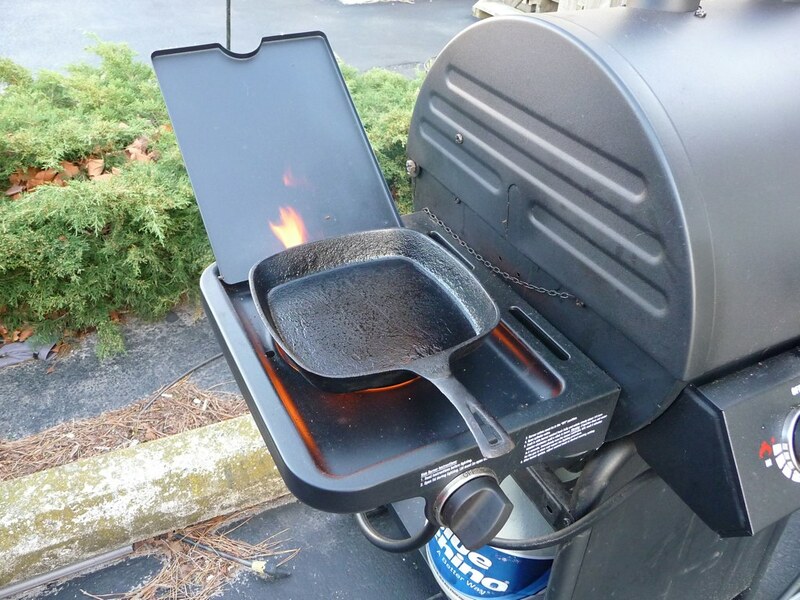 It is then cooked in an extremely hot cast iron skillet. The characteristic brown-black color of the crust results from a combination of browned milk solids from the butter and charred spices. While the original recipe calls for redfish, the same method of preparation can be applied to other types of fish and other protein sources, such as steak or chicken cutlets. Don’t let all that mumbo jumbo throw you. It’s really simple. 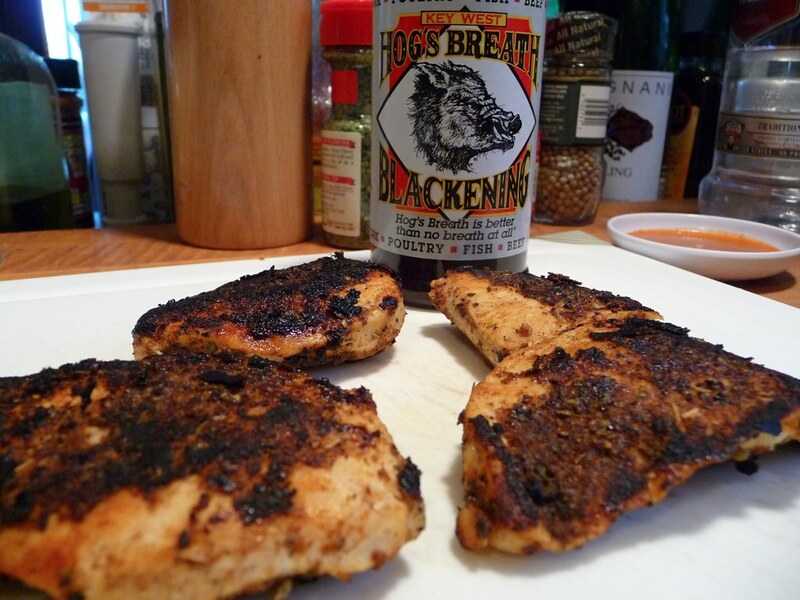 Get yourself some “blackened seasoning” from any source, sprinkle or rub heavily on your meat and cook it up! The best way to cook it up? You will need a cast iron skillet or comal – a flat, cast iron pan or flat griddle typically used in Latin America to cook tortillas, toast spices, sear meat, and generally prepare food. 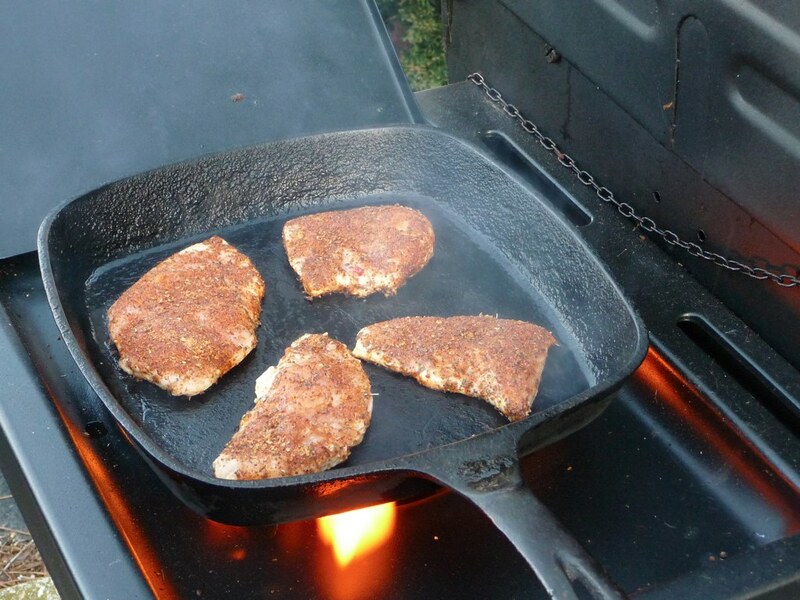 We have a side burner on the Char-Griller so I cranked that up and got the cast iron skillet white hot. The chicken seared quickly, developing that wonderful dark spicy crust, and the meat stayed moist thanks to the italian dressing marinade. 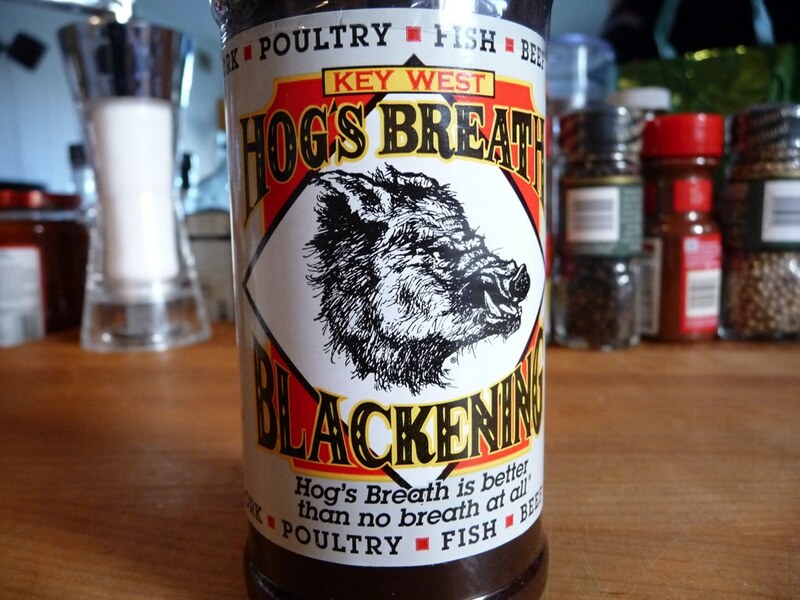 Our seasoning choice this time around was Hog’s Breath Key West Blackening. Texture & Appearance: Most blackening seasonings are very light in color, and this is no exception. A combination of powder and shredded bits of seasonings – ours had picked up a bit of the moisture and salty air of the beach, and so had some clumping as a result. It still broke down nicely and made for a medium coating on the chicken pieces. Taste: Pungent and spicy with hints of the citrus from the lemon juice powder and oil, this proved to be quite hot on the chicken. Heat Level: – Usually reserved for sauces, it’s hard to put a level to the heat in a rub, but my best estimate is 2.5 out of 5. Label/Graphics: – I love this package! The hog graphic means business, and the dark plastic bottle is a fantastic marketing gimmick that actually works for me! 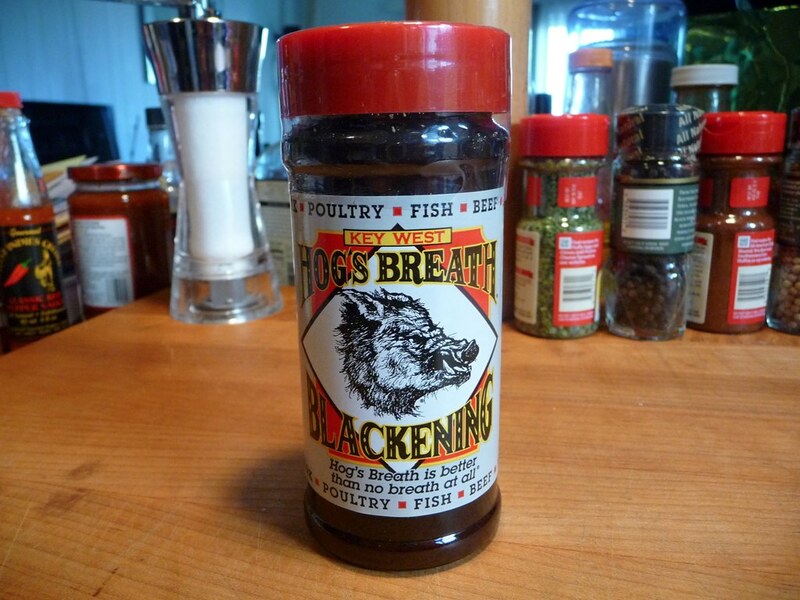 It “appears” that you are buying a blackening seasoning that just may actually be black. Silly of me to fall for it, as I stated earlier almost all blackening seasonings are light tan in color. But I fell for it mentally, and I’m not even phased by it… I just think it’s an awesome approach to the package! The only thing keeping me from awarding 5 stars – and this is nit-picky – but the words “Key West” at the top of the label are throwing me off from figuring out exactly what the full name of this product is. Key West Hog’s Breath Blackening, Hog’s Breath Key West Blackening … where to put the “Key West”? 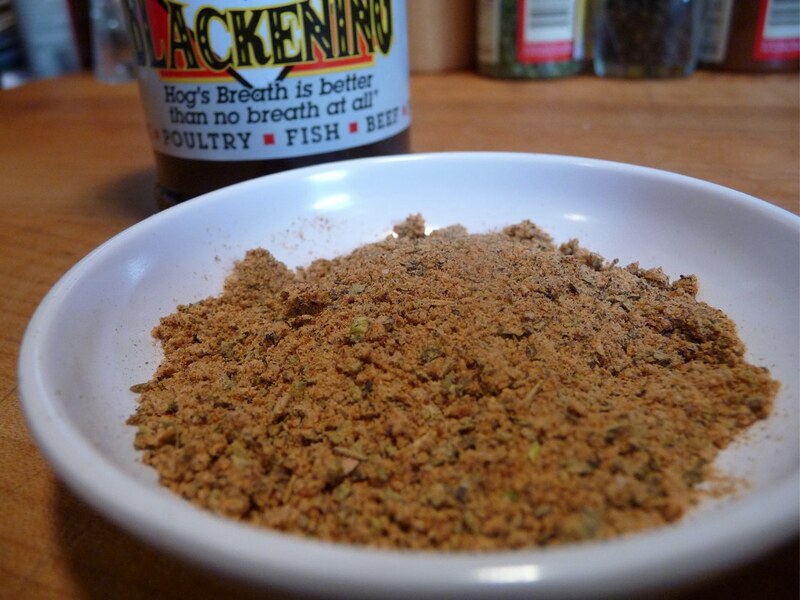 Overall Rating: – With it’s deep, dark, smoky, spicy flavor, this blackening seasoning is a winner. The intense flavor and classic spice and heat put this blackening seasoning at the top of it’s class. Great job. Hog’s Breath Saloon #1 in Key West, Florida explains the “Key West” on the label. Hey, I’ve never been to Key West so I didn’t know, ya know? I have been to Hog’s Breath many times. They have really good food. So I am glad to hear you liked this one. I have been using the Todd’s Bayou Dirt for about a year, after your review of the product. How do they compare with each other? Tim, the Hog’s Breath is less salty and more of a traditional blackening spice. Todd’s Dirt Bayou is more of a Cajun seasoning with more heat. Both are excellent products in their own right. Nice to hear you are a Todd’s Dirt fan as well as a Hog’s Breath customer. And I appreciate your trust in us for reviews. I think you will like the Hog’s Breath Blackening. Marilyn turned me on to the italian marinade. As for the names of these things that is half the fun! First off, happy belated birthday to Marilyn. I haven’t tried doing it with chicken either but I have had it at restaurants and it was very good. Their package rocks, that is one bad a%% pig. Nice review! That chicken looks delicious. 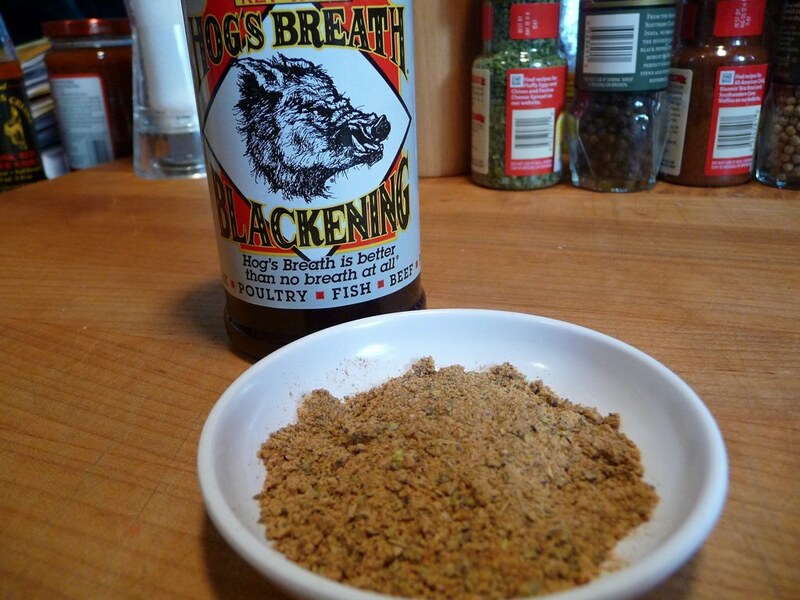 The Hogs Breath Blackening I have been using for 4 years now and it’s definitely my favorite for Pork, Poultry, and Beef. I use Phillips Blackening for Seafood only as it has a slightly different taste that seems to mesh with fish better… Just an opinion. I just used some the other day on a blackened blue burger. Tasty. For seafood, we prefer Old Bay Blackening, but I’ll have to try the Phillips sometime.